If a Democrat President trashed the United States like this on foreign soil, Republicans would accuse him of treason and demand impeachment. American relations with Europe Trump deems the EU’s fault, Trump goes so far as to describe the EU as our “biggest foe.” American relations with Russia, he declares is the fault of American “foolishness and stupidity.” This man is not on our side. Russia invades and conquers Crimea. Russia shoots down a Malaysian commercial airliner, murdering 298 people. Russia attacks Great Britain with powerful nerve agents, murdering British citizens. Russia attacks the American election. REPORTER AP: President Trump you first. Just now President Putin denied having anything to do with the election interference in 2016. Every U.S. intelligence agency has concluded that Russia did. My first question for you sir is, who do you believe? 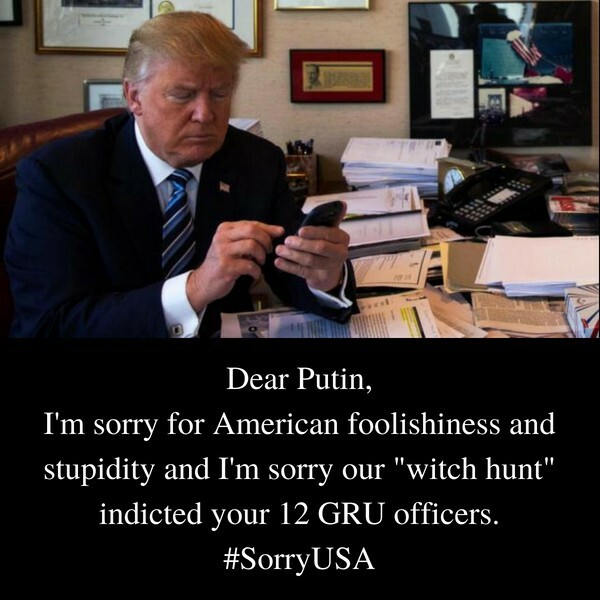 My second question is would you now with the whole world watching tell President Putin, would you denounce what happened in 2016 and would you want him to never do it again? In response to this Trump incoherently babbled about Hillary Clinton’s supposed 33,000 missing emails (there aren’t nearly that many missing, most were recovered from other servers), and repeatedly asked why the FBI did not seize the Democratic National Committee’s computer server (a private firm examined the server and gave the results to the FBI). Within this babble, the closest Trump came to answering the question was to side with Putin over America’s intelligence agencies. Trump: My people came to me, Dan Coats came to me, and some others, they said they think it’s Russia. I have President Putin. He just said it’s not Russia. I will say this: I don’t see any reason why it would be . . . I will tell you that President Putin was extremely strong and powerful in his denial today and what he did is an incredible offer he offered to have the people working on the case come and work with their investigators, with respect to the 12 people. I think that’s an incredible offer. There is indeed much “foolishness and stupidity” going on here, but it’s worse than that, much worse.